Searching for a complete guidance to apply for permanent driving license? Well, we have included step by step procedure to apply for a permanent driving license online. Follow these simple steps and get your permanent driving license with ease. 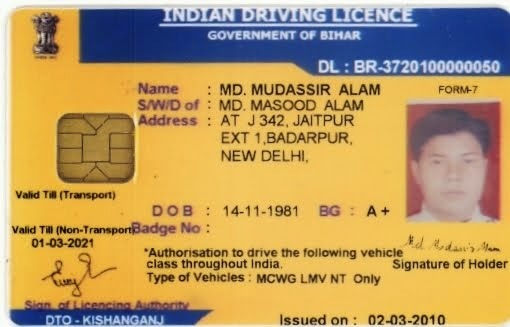 First of all you will require downloading the application form from here http://gujaratdrivinglicence.com/drivingLicenceForms/permanent_driving_licence_form.PDF . Click on this link and download the PDF. It is your application form for permanent driving license. After you download the application form, fill it up with mandatory details. Now, paste your passport size photograph of 5cm x 6cm on the form. Do not staple your photograph. Moreover, bring couple of photos with you. You already have paid the application fees while getting learner’s license. Now, you require bringing those fee receipts with your filled application form of permanent driving license. You have all the things with you for permanent license. You just have to pass the driving test now. NOTE: it is suggested to keep the residential and age proof that you shown at the time of learning license process. Moreover, here is the general information and registration information that you need to know while giving the driving test. ⦁ When you will go through the driving tests, you will be monitored through camera. ⦁ All the tracks have sensors. ⦁ Each test has a time limit whether it’s for two wheeler or four wheeler test. You can get appointment for permanent driving license test. Click on this link http://drivingtesttrack.in/getappointment.htm to get the appointment. These are official links and you can ask for any help regarding permanent driving license. To get the answers of your questions please leave comment below. Have a look at our other articles and get notified. Nowadays, you can get your learning as well as permanent driving license easily online. The online process is very easy and convenient for everyone as well. Feel free to ask for your doubts here! Drive safe and follow the traffic rules!